Ever want to ditch the 9-5 and be your own boss? Choose your own hours and work when you want? With ToolMates Hire, now you can. All you have to do is register and list your Tools and ToolMates Hire takes care of the rest. You can earn from $250-600 per week from just hiring out your tools. With PayPal you can rest assured that your payments are secure and safe. You get paid instantly when someone hires your tool, so you can see the money in your PayPal account right away. 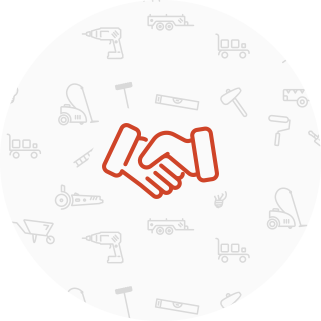 With our bond and item guarantee system you have that piece of mind that your Tool is safe. In the event of your tool coming back damaged then ToolMates Hire can claim the bond from the renter and refund you the cost to get your Tool fixed. You can even opt into our item guarantee - for an extra fee, your tool is covered for up to the value of $1,000. Unique way to hire tools to people who need them. List your unused tools and start earning cash from them today. A renter will find out tool on our website and request to rent it from you. Which you can accep to decline. If you choose to accept the rental request then you arrange when to meet the renter and provide him with the tool. You get paid instantly into your PayPal account so you don’t have to worry about exchanging cash or messing around with change. What kind of tools can I hire? ToolMates cater for all different types of tools, from Gardening Tools like Lawn mowers and whipper snippers to Power Tools like cordless drills and Jackhammers. We even have machinery like excavators and ride on mowers. What if I need the tool? Well that's easy you just select the dates that the tool is not available. Even if you forget you will get email and sms notification when someone requests your tool which you can decline if you need the tool. What notifications do I get? Our system alerts you through email and sms notification when someone is requesting to rent a tool from you.